I was given a Polaroid camera when I was a teenager that I loved. I liked the look of the photos and the ability to have photos developed instantly. In the course of creating my family archives, I found many of those old photographs and wondered what was the best way to preserve them. A battered Polaroid from a friend's house, December 1994. Even back then, I was drawn to archives and records boxes! Polaroids are not archival and were not meant to last forever. They were designed for instant gratification. Compared to other mediums, instant photographs are fragile, especially because the chemicals used in the development process are still in the print and can continue to affect its aging process. As you can see in the Polaroid above, there are rips, tape marks, and stains on this much-loved photo; I know better now. Keep Polaroids out of direct sunlight, moisture (high humidity), and temperature fluctuations. When you’re handling Polaroids, hold them by their corners with clean hands. Oil and dirt from your hands can damage or smudge the photos. Let images dry for several weeks before storing them. Never store them in magnetic albums, or albums made from PVA or PVC, which are types of plastic that can damage photos. If an album smells strongly of chemicals, do not use it. Never cut Polaroids, which can damage them. Dark storage is recommended to prevent fading, although yellowing can occur in lights areas of the print, even when they are stored in the dark. Store them flat, as prints on their side can yellow more than those that are flat. A storage solution if you have many Polaroids that you would like to preserve. 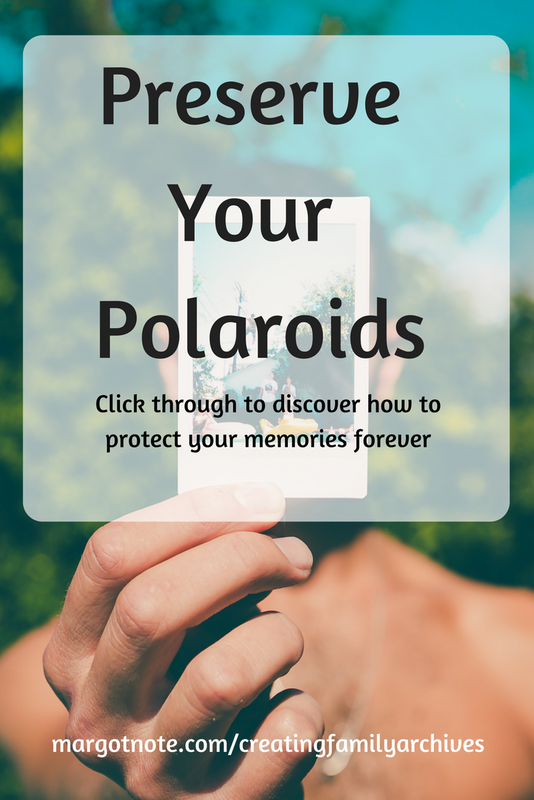 Do you have suggestions on how to preserve your Polaroids? Older PostWhat Does "Archival Quality" Mean?